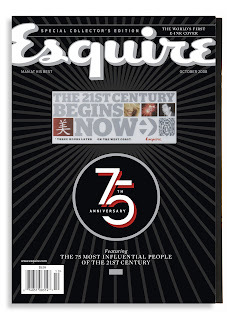 I posted a little while ago about the plans for Esquire's 75th Anniversary issue. A 10inch squared display will feature prominently on the cover, flashing the theme "The 21st Century Begins Now" with a collage of illuminated images. Then on the inside cover, a two-page spread advertising the new Ford Flex SUV with a second 10inch squared display. This ad will utilise shifting colours to illustrate the car in motion at night. The technology for both products uses micro-capsules of ink that are controlled by an electric charge.